c) become or always have been not very good and unemployable. If you fall outside of these three areas, ie you don't like your firm or employer, or want to make a move yourself to pastures new within the profession, you are probably in the minority. It would be very interesting to do a research study to see what percentage of solicitors drop out of the profession at this stage and how many stay on. If our anecdotal evidence is anything to go by, I reckon that the percentage will be something around 50/50. Families, relocation, level of prospects would be the top three reasons for leaving. "After some discussions it seems as if a lot of firms bring diversity to assessment days, but choose young people to fill the spots. What do you think? What are your experiences?" My experience is not the same as this. 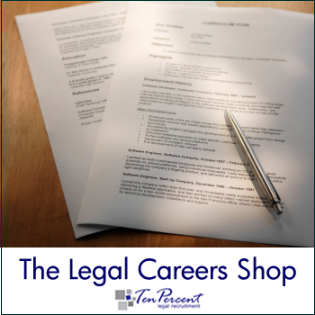 Ten-Percent Legal Recruitment operate in both a larger practice and high street setting, and as such we see quite a mix of practices and lawyers coming through. The number of older trainees qualifying is actually quite high, and it is not just high street firms that employ them. If you think about the function of a trainee, which is to learn how to be a solicitor, but at most firms also to generate income, the older trainees will understand more about the latter, and also when talking to clients, actually look a lot wiser and more experienced than the younger ones. I have also come across firms who have asked for recently qualified solicitors, but not ones who have come straight through from school, as they want someone mature enough to handle the job. Again, this is more the sort of scenario one would find with the age discrimination legislation of recent times! I have found over the years that Eversheds particularly encourage more mature applicants, or at least my perception is such that I have seen more of a number of mature applicants who have trained there than at other practices. You need to concentrate on your own skills and attributes, and try to put out of your head any perceived disadvantages you have. Many years ago, when I was applying for training contracts, I found that the mix of people at interviews and assessment days was such that you couldn't identify a particular type of person who would be the perfect "fit" at a practice. "I am 12 months into my training contract and get hassled from my bosses about reaching targets. Recently they increased my targets promising to give me more family work to do but this work has not materialised. I am based in the PI department and my boss there just gives me scraps to do. The odd time I get my own client but never a PI matter. I cannot reach my target on the work that they give me despite my protestations. They have dampened my motivation considerably as my boss does not give me enough responsibility. When I qualify I will feel 'half-baked'... is this normal? I have also been in PI since last March and have still not got my own PI case load.... I am being used to do the scraps my boss does not want to do. They have told me they are not keeping me on which does not surprise me as the work is a bit thin on the ground. However I feel they are not fulfilling their side of the contract as they are not training me properly... help!" This is a very difficult situation to be in, and also one that is fairly common. Some firms use trainee solicitors as cannon fodder almost, simply because they are so cheap in comparison with other staff - eg; an experienced secretary can cost 30% more than a trainee as a bare minimum. Personal injury in some firms is particularly difficult, and I can remember back to my own training, and the PI lawyer handing over scraps of work, and not wanting to give me anything substantial to do. It may well be that the PI department has very little work to offer you, and the lawyer in the department is struggling himself/herself to get enough work to cover his role at the practice. It may also be that the firm just expect him to have you there and haven't given him any support or guidance in what you are actually supposed to be doing. Quite a lot of trainees spend a part of their training contract twiddling their thumbs, and can finish the contract not having much of a clue as to what their role actually is or whether they can cut it as a lawyer. Usually in some firms the first 6 months after qualification are not times when you are literally pitched in at the deep end, but gradually handed work and clients to start on with supervision, and it sounds as if this is where you will need to be looking. In terms of them not keeping you on, I think you need to look at it two ways - firstly, you will have qualified as a solicitor once your training contract is finished, regardless of how useless this time has been. Secondly, if you make any protestations or request external assistance (ie the law society), you may find redundancy staring you in the face if there is nothing the Law Society can do to ensure your place is safe, which I very much doubt. My best advice is that if this is not affecting your health (which of course has to be your top priority), you may be best sticking the time out, qualifying, and then worrying about gaining experience with another more secure and established firm. "I am well aware that the big city firms pay the most to trainees and qualified solicitors. However does this mean that high street and medium sized firms pay much less, not just to trainees but also to qualified solicitors?" Absolutely! When you read in the newspapers about a law firm in central London paying a newly qualified solicitor £60,000pa at qualification date, it does not have any reflection on the vast majority of law firms pay in the UK. The reality is something different. On the high street, usually only partners get £60k unless a solicitor is doing particularly well, and most solicitors will be earning less than £50k. Newly qualified solicitors usually get paid anything from £19,000 up to £30,000 depending on the field of law and the quality of the work a firm is getting. LSC funded work (legal aid) is usually the poor cousin, and most solicitors are still under £30k after 2 years post qualification (PQE). There is a reason firms pay so much in central Londonfor the 300+ lawyer firms, and it usually relates to the pound of flesh the solicitor has to give in return. A lot of high ranking firms expect serious hours to be put in, and these are often quite out of the ordinary, with horror stories of 18 hour days for 4 months circulating. However, salaries of £300k are not exceptional these days after 6-7 years PQE..
"I am an experienced Paralegal looking for a TC in the North East i have sent out over 300 applications with many rejections and many wont even reply!! I cannot move away from the North East and Yorkshire for personal family reasons and i am considering leaving the proffession all together if i dont get a TC soon. I attach my CV for your perusal and any comments, alterations etc would be appreciated enormously"
Interesting conundrum. However, I would like to set you a task, and if you get to the end of it without having found a training contract, I would be very impressed. Your work experience is not bad, but it isnt that out of this world either (its not very long). 1. find out how much time you are going to be allowed off for your current and former work experience. 2. spellcheck your CV. at present you have a spelling mistake on page 1, which is a catastrophic error!!!! 3. read your CV through carefully, as at present it is a bit rambling and not very clear and to the point. also make sure your covering letter is very brief and again does not ramble - 4 paragraphs of a few sentences per paragraph will be fine. 4. read our guide to getting a training contract, and send out your applications to selected firms. 5. call all of those firms and get a response. 6. take a week off work and go round each firm and ask to see a partner, solicitor or trainee solicitor to discuss. "There's been a lot of talk flying around about the credit crunch and its knock on effects. Last time something like this happened NQs had a really tough time of it. I start my training contract at a medium sized City firm in September, qualifying in 2010, so what does this mean for me? Will it be harder to move around on qualification, or get a job at all? And will it only affect those going into corporate seats, or will my preferred area of private client suffer too?" Wills & Probate and other private client areas do not ever appear to suffer downturns, it tends to be things like commercial property, commercial litigation and residential development and conveyancing that have cycles..